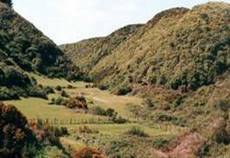 Seton Nossiter Park is a 30ha protected natural reserve nestled in the steep gullies between the surrounding suburbs of Grenada Village and Horokiwi to the north, Woodridge to the east and Newlands and Paparangi to the south. The embankment of the Northern motorway forms the western boundary. The park is over 2.0 kms long. The Belmont Stream flows through the park and is a prominent and attractive feature. It is a major tributary of the Porirua Stream that flows from Glenside through Tawa to the Porirua harbour. The main entrance to the park is from Mark Avenue, (Grenada Village), where there is a parking area and a service road down into the main valley floor. Other entry points are at Bushland Grove (Paparangi) and Colchester Crescent (Newlands). Seton Nossiter Park provides several walking tracks through native bush. There are open space areas, streams, and several picnic spots. It is very sheltered and has its own micro-climate due to its low lying nature to the surrounding hillsides. It provides a natural environment for recreational use and enjoyment. The park is used for a variety of activities including use by the three neighbouring schools for nature study, bush-craft, local history studies, and cross-country runs. It is a haven for informal recreation and natural atmosphere. The park not only provides an important vegetation link between the adjoining suburbs, but also presents a bird and wildlife corridor between the eastern harbour escarpment, the Belmont Gully and ultimately the Belmont Regional Park. Some of the birds sighted in the park are the native pigeon, tui, fantail, waxeye, morepork, grey warbler, long-tailed and shining cuckoo, grey duck and kingfisher. Bell-birds have been heard. This is in addition to the regular quail, magpie, sparrow, starling, blackbird and skylark. A remnant titoki-tawa forest is located on the valley floor near the traditional picnic site and extends up the slopes on both sides of the valley. The park is part of the Wellington Outer Town Belt that runs in continuous sections in a northerly direction from the southern coast, through Karori to Otari to Mt Kau Kau and on to Porirua (west of the motorway) while branching to the east at Glenside through Seton Nossiter Park to Belmont. There is an information panel erected at the entrance from Mark Avenue depicting the history of the Belmont Viaduct that was constructed in 1885 and traversed the gully as part of the Wellington & Manawatu Railway Company. The viaduct was one of the great engineering achievements of 19th century New Zealand and is a distinctive and memorable part of this country's early transport system. The original gigantic wooden trestle span not only played a significant role in developing early Wellington, but also eventually became part of the North Island main truck line. It was the largest wooden structure of its kind in New Zealand. The viaducts original foundation abutments are not far from the main entrance and remain clearly visible. 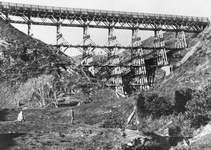 The viaduct was decommissioned in 1937 following the opening of the Ngauranga-Tawa tunnel that runs directly underneath the old supporting abutments. Refer to our Section ‘The Belmont Viaduct' for further information. An important feature of the park is the Flood Detention Scheme that was introduced in 1991 to protect downstream properties. The streams culvert under the northern motorway was narrowed and by using the embankment as a natural dam, the water flow during times of peak rainfall is limited and the stream has a regulated discharge to control flooding at Tawa and Porirua. Under the Reserves Act 1977, the park is a recreational reserve that gives priority to outdoor recreational activities, walking tracks, open spaces and protection of the natural environment. 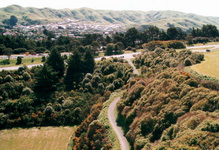 Under the provisions of the Act, the Wellington City Council was required to prepare a Management Plan for the park to guide its management and development. This plan ensures that the natural character of the Park will always be retained and enhanced where possible. To ensure that there was direct local input and community representation in the preparation and development of the plan, the Seton Nossiter Park Working Group was established in 1994. This working group represented a large number of local community groups, park users and other local people. It was also formed to ensure that the communities and other park user's interests were identified and recognized. The Seton Nossiter Park Working Group and the Woodridge Planters assist the Wellington City Council in maintaining the park. Over the years more than 25,000 native trees have been planted. The aim of such plantings is to enhance the natural environment and to contribute to the greening of the local area. The maintenance program involves the controlling of weeds. Protecting planting, supporting natural vegetation and the general welfare of the overall park.